It’s almost time for our annual Faith and Friendship fundraiser and so I’ve been reflecting a lot on the gift of Christ-centered friendships. To be honest, I don’t know how I would be surviving this year of grief without them. There’s something different about a faith-filled friend. Christ-centered friends know suffering is part of a bigger picture and that we are all part of a bigger picture, which creates a safe place for listening without judgement and trying to “fix-it”. When you share a Christ-centered friendship there’s a deeper love, deeper commitment, and deeper humility that allows for a beautiful, humble sense that we are all walking together in this journey of life. There is so much isolation and loneliness in today’s society. It can be hard to find these types of friendships. If you’re looking for more Christ-centered friends in your life or wanting to better nurture the ones you have, I invite you to reflect on what may get in the way of deeper relationships. Have you been hurt in the past by friends and afraid to reach out to start new friendships? Are you over-committed and have a hard time finding time for friends? For those of you who have younger kids or a lot of grandchildren, are you not giving yourself enough time to be with adults? Do you have a hard time getting outside of your comfort zone and reaching out? I want to share with you a prayer I’ll be reflecting on at the Faith and Friendship luncheon. It beautifully articulates the sacred space that I’m passionate about providing in the ministry and experiencing in my own friendships. A prayer of thanks for the gift of good friends. By Scotty Smith. Edited. Heavenly Father, I cannot imagine how storms can be navigated, burdens borne, and hardships handled without the company of a few good friends. I praise you today for the gift of friendship—for the joy, encouragement, and refreshment you give me through my friends. When we walk through difficult and draining seasons, we’re inclined to think, “No one can possibly understand what I’m going through." That’s when the gift of long-standing, all-weather, burden-bearing friends becomes especially precious. I praise you for friends who know how to “refresh the hearts of the saints”—including this saint. I praise you for friends who remind me of the truth and power of the gospel, of the love of Jesus, and of the bigger story you are always writing. I praise you for friends who share their lives and not just their gospel. I praise you for friends who offer tears and not just their answers. I praise you for friends who give life-giving wisdom and not just mess-fixing formulas. Father, my all-weather friends turn my heart heavenward. They simply remind me that the foundation and fountain of all good friendship is found in the gospel. It’s overwhelming, settling, and centering to hear Jesus say to us, “I no longer call you servants… I call you friends” (John 15:15). I would love to hear comments from those of you who have made an effort to find faith-filled friends. How do you reach out to find them? For those who have treasured friendships, how do you nurture them? And what do you value in your friendships? Please comment below so everyone can see and feel the beauty of a faith-filled community of sharing. You don't have to subscribe, just write a comment in the box, click on "post comment", enter your name, and click “comment as guest”. You don't have to fill in your email or name a website to comment as a guest. If you’re like me, this is a question you really don’t want to think about or honestly answer. As I’m working on the gratitude retreats that are coming up, I realize I have to take a look at complaining. If you want to be a more grateful person but feeling frustrated about certain people or situations in your life, an honest look at complaining will help you get over that hump to a place of gratitude. Complaining can be a habit you don't even realize you have. I find that I'm constantly complaining that I'm tired. It's like I'm expecting at all moments to feel perfect, awake, energized and motivated. If I don't feel all of these things, I think there's something wrong with me, and I complain about it. It's become a habit because I notice it's the first thing that comes out of my mouth when someone asks me how I'm doing (even if I’m not that tired!). What about you? Are there some chronic complaints that you're in the habit of saying about yourself? "I'm so slow." "I have the worst luck.” “How come I can never get a break?” Or maybe there are some chronic complaints you’re in the habit of thinking about or saying to others? "You're lazy." "You don't understand me." "You're not listening." To be sure, there are statements of fact. There are times when saying, "I'm tired" is simply self-awareness which can help you realize you need to take better care of your body. Personally, since I’m deep in a grieving journey I do get tired a lot and I do need to acknowledge that and rest a lot. There may be some real health, respect or boundary issues that you want to recognize in your life as well. I’m not asking you to ignore the things that are truly important to recognize. The invitation here is to ask yourself whether there are some chronic complaints you make about yourself or others that have become part of your everyday habit and behavior and contribute to a never enough feeling. No one wants to think of themselves as a complainer but recognizing the never enough feeling is the key to the journey towards gratitude. The vicious cycle of complaining that the people or situations in our lives are never enough is unhealthy for our relationships, health and faith and gets in the way of living a life of gratitude. Are there chronic complaints you make that may be unhealthy for you? Take a moment and reflect on who and what is enough in your life. Here’s an interesting poem by Mary Jo Leddy from the book “Radical Gratitude”. It illustrates this never enough trap that is so easy to fall into and may help uncover some thoughts for you. on the way to somewhere else. An invitation to live a life of gratitude is not an invitation to deny there is injustice and suffering in the world. It means grounding your outlook in all that you do have and responding to the things heavy on your heart with a more loving heart. When you respond from a place of abundance, your response is more mature and fruitful. When you respond from a place of scarcity, the way you approach conversations and decisions will be based on fear, and the response will not be as loving or effective. A look at complaining is only a small (but very interesting) part of the online retreat “Grace and Gratitude: Cultivating a heart that believes I have enough, do enough, and am enough” starting Monday, March 18th. The majority of the time we’ll be exploring all of the different ways God’s grace is available to us, how God’s grace can show us we have enough, do enough and are enough and how we can respond in gratitude. You’ll see how gratitude can be a moment to moment practice of receiving God’s grace and responding in gratitude, which makes for a much more peaceful, prayerful, serving way of life. It’s a gratitude practice that works no matter what is happening in your life. I’d love to hear what you think of this reflection. Do find it’s easy to get in the habit of complaining? Do you notice the difference when you approach a situation from a place of what you do have rather than what you don’t have? Love is patient and kind?! Ugh! How often are you open to God’s grace and love? And how could this have something to do with how grateful are you? Honest… Authentic… Prayerful… what do you want to be? It’s a new year and with that comes the question everyone asks, “What’s your new year’s resolution?” This year, instead of writing a list of promises, how about choosing one word as your focus for the year? Find a word that keeps you focused on how you want to live your life. Commit to one word that helps you grow closer to the person God created you to be. You may know immediately what your word of the year should be. If you have no idea, I've put together a list of prompts below to help you reflect on what brings you joy and what drains your spirit. If you go through these questions you may see if there are habits, behaviors or rituals from the past that you miss and want to begin again. Or you may find it's time to let go of some things. I’m choosing the word “gentle” as my focus for the year. As I grow deeper into the reality of the loss of my son, Peter, over the summer, I know this year I will be focused on the work of grieving. I want to remember the word “gentle” throughout this time. When I get frustrated at my low energy level or overwhelmed with emotion, I’ll remember I’ve promised to be gentle with myself. When I’m making choices over where to spend my time and energy, one of my discernment questions will be, “Does this feel gentle?” Maybe this is a time in your life where you feel called to have a word like “gentle” that speaks to your ‘being’ rather than ‘doing’. Or maybe it’s your season to get out there and take some bold steps. Here’s a list of prompts to help you reflect. Reflect on the following prompts to help you discern your word of the year. What makes me feel fully alive? What positive word described me as a child? Am I still in touch with that word? What will I regret not doing or being in my life? What helps me feel or sense a connection with God? What is the one thing in which I’m being too critical of myself? You don’t have to think of your word right now! Give yourself some time with this. Spend some quiet time journaling, listening to music, looking at an inspirational picture, or simply sitting in silence. Let the word come to you slowly so you can hear the word God is drawing you to at this time in your life. May you allow yourself the time and space to hear the quiet, still voice of God speaking to your true self deep within your heart and soul. Please share your word with me or let me know what you think about dedicating yourself to simply one word this year. I love hearing from you. Do you get excited or do your shoulders begin to tense up the second Thanksgiving ends and the countdown to Christmas begins? Wishing you could appreciate the meaning of the Advent season this year? Advent comes from the Latin word meaning "coming" and is meant to be a time of preparation for Christmas and the celebration of the birth of Jesus. It's intended to be an intentional time to work on our own internal preparation for a deeper connection with Jesus. Can I be honest here? This time of year feels like the least spiritual to me! There are so many material distractions and social commitments that leave little time to go within and do the work of internal preparing for the coming of Jesus. That's why I want to share this wonderful checklist that has helped me sort out my expectations and values over the years and learn to say "yes" and "no" to the kinds of things that will help me appreciate the true meaning of the season. Tension during the holiday season can be caused by a conflict among your expectations, values and reality of how much time, money and need for perfection you may have. Give yourself time to sort out what stresses you and what nurtures your spirit. Afterwards, ask yourself how you can make some adjustments that will allow for a more meaningful season. I’d love to hear if this checklist helped you or if you have any other ideas to share that help you experience a meaningful Advent season. Where does your gratitude come from? When does it appear in your heart? These may not be the questions asked at your Thanksgiving dinner if you have a holiday tradition of sharing gratitude moments, but these are the questions I’m thinking about as this year’s season of gratitude is held right in the middle of the traumatic fires and shooting images, not to mention my own personal family tragedy that’s heavy on my heart. These are important questions to ask if you’re having a hard time finding something to be grateful for in the middle of stressful times. Are you thankful when things are going your way? Or are you able to find gratitude in recognition of God’s grace? This year I invite you to look at gratitude as a response to your belief in and awareness of God’s grace. Gratitude takes on so much more meaning when it comes from a recognition of God’s grace. God’s grace is a free gift from God. It’s God’s very life within your being. There’s no earning it; it’s always around. All we have to do is recognize it, name it and give thanks for it. It’s the best formula for gratitude. Recognize it: Every moment of every day will present an opportunity to recognize God’s grace. Whether it’s a comforting phone call from a friend or a beautiful golden leaf that’s just fallen off a tree at the change of the seasons, you can always find expressions of God’s beauty and love. Name it: Once you recognize God’s grace, give God the credit, especially in the ordinary moments. The more you praise God for the seemingly ordinary moments of grace, the easier it will be to find them in the more stressful moments of your life. The more you get in the practice of finding your grace-filled moments, the more you’ll be comforted that God’s presence is always around. Give thanks for it: When you give thanks to God for every moment of grace, you’re making your gratitude practice a prayer. This practice will sustain you through anything, as opposed to a gratitude practice that comes from everything going your way, which is not a recipe for a peace-filled life. Rooting your gratitude in God’s grace makes gratitude an awareness that every moment is a pure gift from God. The more I recognize this, the more I see there are no entitlements in life and the more I treasure each moment, each person, and each event in my life as a beautiful act of love from God. Rooting your gratitude in God’s grace keeps you connected to God’s joy and goodness. Last weekend I held a thank you dinner for some of the women in my neighborhood who helped me and my family during my son’s 25 day nightmare in the hospital this past summer. Making the dinner, planning my friendship prayer and creating a special evening for them fed my soul. Of course it didn’t take away the pain of losing my son, but it did connect me to the God-centered goodness that I experience through them. Those feelings of God’s goodness transcend the pain. Those moments of pure love fuel hope. This month (and every month!) I invite you to practice gratitude with an awareness of God’s grace. It will fill your heart with love and offer the promise of hope. If you are interested in learning more about this topic, “Grace and Gratitude: Cultivating a heart that believes I have enough, I do enough, I am enough” is our next retreat starting in March. Learn more here. I’d love to hear your thoughts on gratitude. Do you practice gratitude? Share your gratitude practice with us. Please comment below so everyone can see and feel the beauty of a faith-filled community of sharing. You don't have to subscribe, just write a comment in the box, click on "post comment", and enter your name. You don't have to fill in your email or name a website to comment as a guest. Would you like my monthly reflections sent to your inbox every month? There are times in life when you feel too sad or too tired to pray. Well, let me explain. It certainly doesn’t feel good to be in those times of life. I’m there right now and it’s hard! But when you’re in a space in which there is nothing in you to come up with formal words or energy for the latest prayer practice, you’re completely empty and open to the Holy Spirit doing all the work. There are no nagging thoughts about how you ‘should’ be praying, no voices in your head asking ‘am I doing this right? !’, and no shameful feelings wondering ‘am I holy enough?’ to distract you from being alone and authentic with God. You’re forced to allow God’s presence to be your prayer and to surrender to that being enough. During stressful times, you may have feelings of helplessness or confusion. In these times, it helps to allow your awareness that God is present to be enough of a prayer. I saw this quote recently and I love it. A prayer of stillness is not a passive act. You are intentionally making the effort to be within the presence of God. The intention is what makes prayer, prayer, according to Joyce Rupp, author of several books on prayer. When you make the intention to ‘Be Still and Know’, you will begin to hear the voice of God ever so slowly and ever so gently. In the silence of your heart, you'll be reminded Christ's light will always shine through the darkness. Most importantly you'll slowly hear how to share that light. I'd love to hear about your prayers of stillness. What do you do when you have no words to pray? Or let me know if anything in this reflection resonated with you. Please comment below so everyone can see and feel the beauty of a faith-filled community of sharing. You don't have to subscribe, just write a comment in the box, click on "post comment", and enter your name. You don't have to fill in your email or name a website to comment as a guest. Would you like my monthly reflections sent to your inbox every month? Sign up below. Monday, June 18th, was the day it all began. At 11:30 PM, my husband and I were woken up by my sweet, kind, strong, healthy 16-year-old son, Peter, having a seizure. It was shocking and scary, and the worst feeling of helplessness I've ever felt in my life. We called 9-1-1, he was rushed to the nearby hospital, medevaced to another hospital, and then our family's nightmare began. It turns out Peter had a golf-ball sized aneurysm, and it had bled. Doctors performed a risky, four-hour surgery that next day to close up the aneurysm. It was successful, but then we spent two full weeks with his life in the balance battling complications. Throughout that time, I kept meditating on the story of Jesus calming the sea. I felt like my son and I were on the boat in the middle of the storm, and I was praying so desperately for Jesus' calming touch. Doctors put him in a drug-induced coma. When that wasn't enough, they performed a craniotomy to allow room for the swelling. For two straight weeks, a different doctor was coming in every few hours to talk about something life threatening or heavy. Slowly... ever so slowly... he started improving enough to take him off the coma-inducing drug. We spent six days waiting for Peter to wake up from the coma. During that time, I would match my breath with his, breathing in "yah" and breathing out "weh". I trusted that Yahweh (God) was in us, with us and for us. I visualized the breath of God breathing life into Peter and into his brain. I've shared this breathing prayer in so many retreats, but I never in a million years pictured using it like this. While coming out of the coma, every eye fluttering, reaction to his favorite Bruno Mars song, or hand squeeze felt miraculous during those six long days when we had no idea what to expect when he would wake up. Will he have the same personality? Will he be able to connect with us? Will he be able to move his right side ever again? The doctors cautioned us, but slowly the answers were yes... yes... and yes... It all felt nothing short of miraculous. For the next five days we watched him recover exponentially. Nurses commented they'd never seen someone improve that fast. We could connect with him and started to understand some of his words with the help of speech therapy. 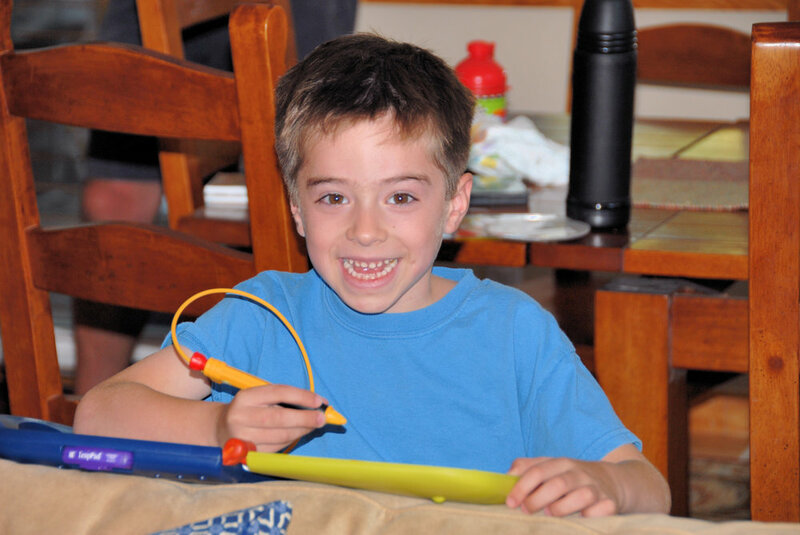 He took his first couple steps with physical and occupational therapists. He texted and snapchatted some friends. On the evening of Wednesday, July 11th, he was released from the pediatric ICU, and we moved onto a new floor to start rehab. This was a huge victory. I spent that night with him in his room. The next morning on Thursday, July 12th at 6:30 AM, I left to get a coffee for myself and the Dr. Pepper he wanted. (He still couldn't swallow or eat but we could put swabs on his tongue). When I returned, I found a few nurses trying to help Peter. His nurse said he had sat up in bed and collapsed. Within a matter of seconds, there were probably 50 people trying to help him. It was a chaotic scene, and I just sat on the floor in disbelief. Peter's aneurysm had re-bled. He was rushed to surgery for a couple hours, but the hemorrhage was too great. My husband and I were called in to hear the words no parent wants to hear. "I'm sorry. There was nothing else we could do." Thankfully, Peter was on life support so we could say good-bye. He was brought back to the Pediatric ICU room he had been in the past three and a half weeks, and we called in family. We had a couple hours to spend with him individually and as a family praying over him til the end. Peter's grandparents, aunt, uncles, two priests from his Jesuit high school, and our chaplain prayed, shared memories of him, and walked him into the hands of God. I held onto his leg and arm and kept saying, "Just keep walking sweetheart. There you go, you're walking into the arms of God. You will feel so much love. He will give you peace. Just keep walking, there you go, good job. Just keep walking sweetheart." As a mom you want to walk with your child into every phase of life. I never thought I would walk my baby into the arms of God. As heart-breaking as that moment was, I will be forever grateful I could be there through his very last breath. This will give me a sense of peace amidst the pain for the rest of my life. This is all so new and shocking and raw to absorb. I'm just in the beginning stages of my grief, and so I have nothing to say that wraps this up into a package that makes sense or offers wisdom. I will say God's presence has been felt in profound ways through family, friends, priests, chaplains, doctors, and nurses who are nothing short of God's angels on earth. We have so many people to thank. I'm sharing my story with you because some of you already know, and for those who don't, I want to be honest about where my head and heart will be during this retreat season. I will still be offering our fall day and online retreats starting September 15th, Your Balance, Your Peace: Finding Contentment in the Rhythm of Your Life. I will be slow and probably forgetful this year as I spend time doing all of the suggestions I offer in my retreats: prayer practices, journaling, reading, listening to music, quiet time reflecting, and sharing my story with safe friends who will sit with me without trying to "fix it". I will also take my advice on vulnerability. I will reach out for help and lean heavily on others, especially the Retreat, Reflect, Renew's board of compassionate women who are committed to serving you. I trust God will help me be wherever I'm supposed to be from moment to moment. Now more than ever I care about the concepts in this upcoming retreat on balance, which are foundational to all of my retreats, my book, this ministry, and my life. Healthy choice-making and setting boundaries in order to live an intentional Christ-centered life are concepts I started learning about fifteen years ago when my son was one year old and I started my spiritual journey. The journey of developing a personal relationship with God with an active prayer life, learning how to own my "yeses" and "no's" when it comes to choosing Christ-centered friends, community, and commitments are a big reason why I feel held in God's hands during this tragedy. My husband, daughter, and I miss this precious boy so much. Peter was funny, kind, inclusive, and full of joy. He was always dancing and making us laugh (the day after his funeral a friend posted on Instagram a video of him dancing to the beat of the fire drill during summer school!). More importantly, he was a rock and a spark of joy for so many of his friends and family. One friend told me, "Peter's the kind of guy who brought out the best in people." With God's grace we'll learn to form a new relationship with Peter in Heaven, and we'll figure out how to carry this sadness while living a purposeful life that is connected with God's joy and goodness. So many of you have experienced deep suffering, and you've graciously shared that in our retreats. My heart aches for you as well, and we are united in prayer. I look forward to the day when I feel strong enough to take all I've learned about this and share it with you. I believe we can get through our suffering in a meaningful way when we are open to God's grace in our sharing, learning, and growing together in God's mystery of life. If you are wanting to reach out to me or would like to share something about your journey of grief that can help all of us, please comment below so everyone can see and feel the beauty of a faith-filled community of sharing. You don't have to subscribe, just write a comment in the box, click on "post comment", and enter your name. You don't have to fill in your email or name a website to comment as a guest. June is here and that means it's summertime. It's time to enjoy longer days, warm nights, and hopefully the gift of fewer obligations that will allow for a slower pace to relax, read a book, or get together with friends. Or maybe... just maybe... do nothing. Yes. I said "do nothing". Does that sound wonderful? Or a little scary? If you feel like you're always trying to keep it together, follow a strict routine, or you're busy taking care of everyone except yourself, it's time to give yourself permission to do nothing. At first, that may sound absolutely delightful! Try it and you may admit it feels a little scary. When you stop and intentionally give yourself time off from your "to-do" list and obligations, you're all of a sudden in a quiet space alone with yourself and your thoughts. You may welcome this or you may be scared of this. I'll be honest. After hearing about the suicides of designer Kate Spade and then CNN's chef and author Anthony Bourdain this week, I wondered how a reflection encouraging people to be alone with their thoughts would be perceived. I started trying to think of new ideas to write about for this month's reflection. I concluded that this is the perfect subject to confront. We live in a loud and complicated world full of manufactured images that tell us a busy life is an important life which will make us happy. This can leave us feeling the pressure to put a lot of time, energy, and money into being busy and keeping up with others. Feeling sad, confused, lonely, or angry may feel wrong or uncomfortable to admit to ourselves or others, but they're important feelings to allow time to surface and explore. In light of this week's suicides, I want to be sensitive as I invite you to be alone with your thoughts. I encourage you to seek professional help if you sense that time with your thoughts is taking you to a dark and dangerous place. For those who are needing to unwind or sort through things, think about what giving yourself time to "do nothing" looks like for you. It may mean giving yourself time to sleep, cry, hang out on the couch, or go for a walk. It may mean allowing yourself time to feel confused, lonely, sad, or joyful and grateful for the life you have and the friends and family who surround you. If you lead a very busy life, you may need to schedule time in your calendar to "do nothing". Here are a few suggestions to schedule time for yourself this summer. Consider taking Fridays off for the summer to give yourself time to "just be". Set boundaries with family or friends so you can carve out a few hours for yourself. Set a timer every day for ten minutes to sit in silence. Take a time out from technology, which can cause anxiety. Recognize how much TV you're watching and assess the right balance for your mental and spiritual health. When you allow yourself quiet time, you're leaving open a space for God's grace to emerge. Sometimes that means allowing feelings to surface so your heart and soul feel cleansed and ready to move on. Sometimes that means moving through an issue slowly so you can better discern where God is leading you. Sometimes it means stopping to recognize all of the good in your life and allowing for a moment of gratitude. In light of this week, keep in mind that God's grace can also come in the form of professional help. God put a lot of amazing people on this earth who are skilled to walk us through pain and sadness. Cooperating with God's grace can be about seeking out a family therapist, psychologist, spiritual director, or compassionate friend. Or it can be about offering to get help for a friend or family member. Most importantly, when you make time to do nothing, make time to do nothing with God. Let yourself rest in the arms of a loving God. By the way, if you're going through a life transition, you may be interested in our online retreat that starts Monday, June 11th. You can jump in on the retreat even if you're a few days late. Register here. I would love to hear your comments. Do you ever schedule time to allow yourself to "do nothing"? In a few hours we'll be hosting 55 people at our annual Faith and Friendship Celebration so my mind is on faith-filled friends right now. I'm thinking about the gratitude I feel for the friends I can share my spirituality with, and I'm thinking about the people I talk to who yearn for real friends in their life. There are so many people who feel isolated. Some of them are surrounded by people, but the loneliness comes from not having anyone to share their faith with or call when there's a problem. Others simply don't have many people in their life and are looking for more connection. Whichever category you're in - and even if you do have plenty of faith-filled friends - I encourage you to take a little time today and think about the values you care about in a friendship. The more you practice these values, the more meaningful and dependable your friendships will become. Here are some of the things I value in a friendship. What are yours? Affirmation. When I share my fears or concerns with a friend, I appreciate when he or she doesn't try to talk me out of the feeling or tell me why I shouldn't feel that way. When I'm scared or stressed, all I need is a safe place to share. A Listening Heart. I appreciate when my friends listen without giving advice. Sometimes I ask for insight and feedback, but many times I just need to vent. Listening without trying to "fix-it" is a sign of respect and it's empowering. You're telling someone you support them and know they are capable of working it out. Authenticity. I care about friends being honest and real and true to themselves with me. I don't enjoy being with people who are trying to impress me or pretend that everything in their life is perfect because everything in my life sure isn't perfect. It's nice to have an authentic conversation. Confidentiality. I appreciate having friends who I can trust will not share whatever I'm sharing. Looking at these values I can't help but notice they are many of the same "rules" we suggest in our retreats, especially during the small group sharing in our day retreats. I hope you'll spend some time reflecting on them and creating a list of your own. It's also a good time to ask if you're providing these values to others. Practicing these values and creating additional ones can open the door to deepening friendships and creating a safe space to share your faith. Many of these values are summed up in a prayer we'll be sharing today at our event. I hope you'll join us in spirit by praying this today. A prayer of thanks for the gift of good friends. I'd love to hear from you. What are important values to you in a friendship?